I chose to take the whole Junior High route in answering my questions. Being that I primarily work with junior high students I am going to answer each question as it pertains to junior high ministry. What do you see as some of the main issues junior high youth ministry is struggling with today? Junior High Ministry is really unique in that it faces its own unique challenges. The first issue is that young adolescents are experiencing life and culture way differently than they did even 10 years ago. We have had to be much more intentional about talking about sexuality, making wise choices, etc over the last five years than we had been in the previous 5. The next area that I think the church as a whole (not all) still struggles with is not putting middle school ministries as a strategic front to reach young people with the gospel of Christ. Stats show that 85% of believers become Christians before the age of 14. I think much of the church has not understood this point. More churches need to see Junior High Ministry as a huge opportunity to reach people with the gospel and invest more resources towards it. Often junior high ministry is either delegated to a layperson or given to an inexperienced intern to run. Churches need to be willing to invest in professional youth workers to take on the challenge of making disciples and reaching young teens for Christ. For the rest of this point I will refer to this open letter to the church that was put together by a group of middle school leaders a few years ago. I also feel that many (not all) junior high ministries in the country are doing one of three things with their programs that could be hurting their programs. 1. Their Junior High program only consists of a Confirmation program, which involves the teaching of only “head” knowledge. This is a huge disservice to our middle school teens as they need to opportunity to process how there faith affects their real life. 2. To maximize time/resources/leaders ministries are putting their junior high and high school programs together. I really think this is a big mistake. Developmental middle school students are at a much different place than high school students. I think putting them together can hurt both ministries. However, I think from occasionally there is an appropriate time to bring them together. I would say when you have the resources to split, it needs to be done. Kurt Johnston had a great post this week about this very topic. He has some great insight at his blog. 3. The “dumbing down” of programs because of the myth that junior high students cannot go “deep”. Junior High ministry needs to be a blast. It needs to exist in the context of fun. However, sometimes I think ministries neglect the content for the fear that students really don’t want to go “deep”. Our small group leaders are constantly having deep conversations with our JH students. We have seen a hunger in our students to know God and a desire to learn how to be a Christian in our current culture. What do you see as some of the main issues junior high ministry is responding to effectively? Junior High Ministry is also doing a lot of things right. 1. Allowing Junior High Students to process their faith in small groups settings. Small groups can work in junior high. I believe those ministries that have implemented them have found success in that junior high students are having relational connections to other students and leaders, it has provided a safe place to question and doubt, and it provides a place for students to be supported in these transitional years. 2. More training available for junior high specialists and laypeople. This year I was pleased to see that there were more seminars offered at the National Youth Workers Convention for junior high leaders than ever before. This is very encouraging. It is also encouraging that these seminar rooms were packed with people hungry to be more effective ministers to young teens. 3. It seems like there are more people that are seeing junior high ministry as a life long calling than ever before. I am meeting more “just” junior high workers than I ever had before. The old stat that I have heard before is that there are only 400 “just” junior high pastors in the US. I am thinking that is changing. In what ways does junior high ministry need to change? There is a pretty big void when it comes to Junior High Ministry Curriculum. This seems to be an ongoing struggle year after year. At the [Youth Specialties] booth there was a very small table with very few junior high ministry books. In my opinion the best stuff out there right now is Simply Junior High’s Stuff and well as the Junior High Talksheets. Students are so busy and God and church is not always the #1 priority. This doesn’t just pertain to Junior high Ministry but to all youth ministries. It can be so frustrating for the youth worker to get parents and students to commit to the church over, sports/drama/ or other school activities. What are we telling our students when week after week we spend our Sunday at soccer games? Joshua is a junior high youth pastor at the Evangelical Covenant church in Mankato, MN where he has been serving for 9 years. Check out his blog here. 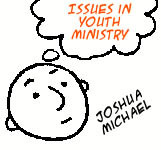 Issues in Youth Ministry: What needs to change?